superphoebe: To space or double space- it's driving me crazy! 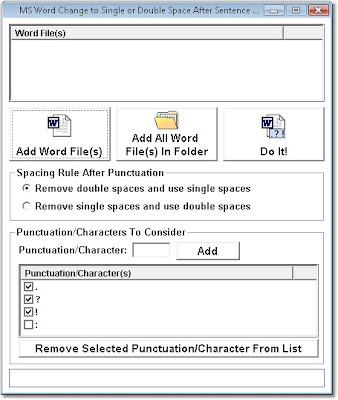 It has been years since this has come up so frequently in my life, but over the past few months, I have been surrounded by the confusion of spacing after punctuation in word processing. It is mainly in several of my friends' resumes and cover letters that this has come up but also in blogs, personal emails/letters and even twitter! One space after end punctuation. The 2 space deal was for typewriters, but word processing programs automatically adjust for the space. You can use my street cred— associate prof at UMUC. And, how many spaces after colons? I also heard this discussed in my grad program. Several of my teachers hated the improper use of double-spacing. So, does this mean that it is weird if I know some actual millennials who double-space after everything but commas? Do you still double-space and/or believe it is more proper? When did you switch, if you did? I have a vague memory of being told to stop the double-spacing sometime in college- possibly 1994? I pretty much accepted it and never looked back. I like the single space. You?